"Not quite what I once was"
Remember in "A Plumbing We Will Go"....when Curly mistook electrical conduit for water pipes????? 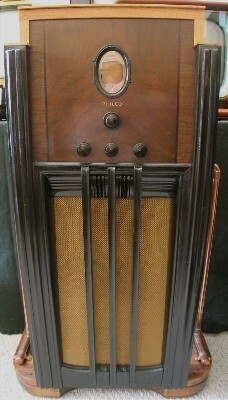 The result, as I'm SURE you remember, was Niagara Falls coming out of the television set......well, nothing like that will happen with this set but again, Vintage Radio needs to be more than talking furniture!!!! 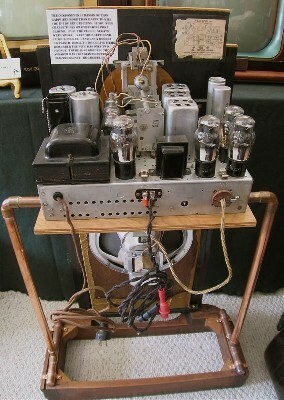 The cabinet of this 1935 Philco was getting on my nerves.....so I scrapped all the boring parts and combined a little copper plumbing technology and viola' a new work of art...."Not quite, What I Once Was"........excellent 5 band radio....perfect reception....new and improved good looks....humorous warning on the back....tube layout...polished chassis...new grill cloth....electrically resored chassis....all new tubes....which really means NEW everything.............Offered at $$750.00........a steal!